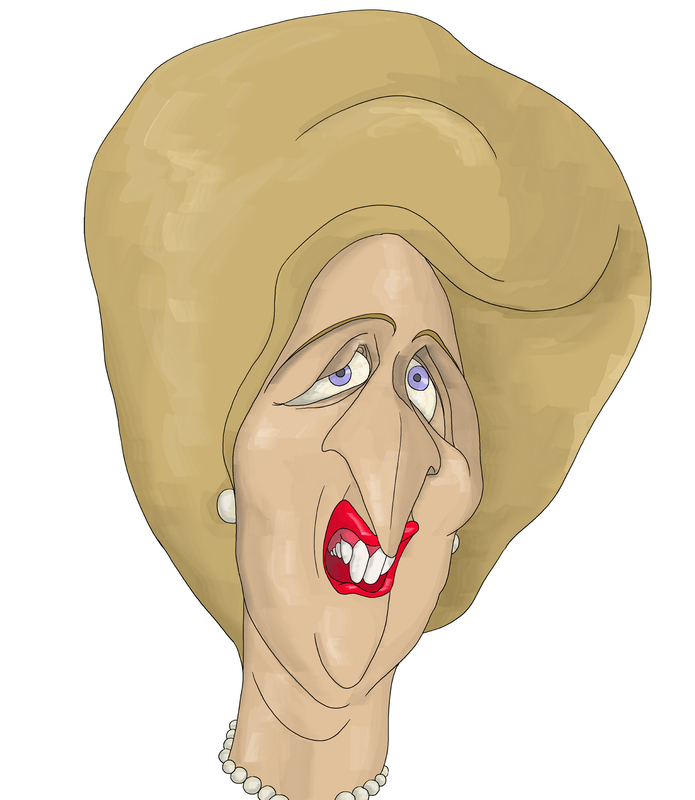 It is always a pleasure to be able to put up a picture of Margaret Thatcher. 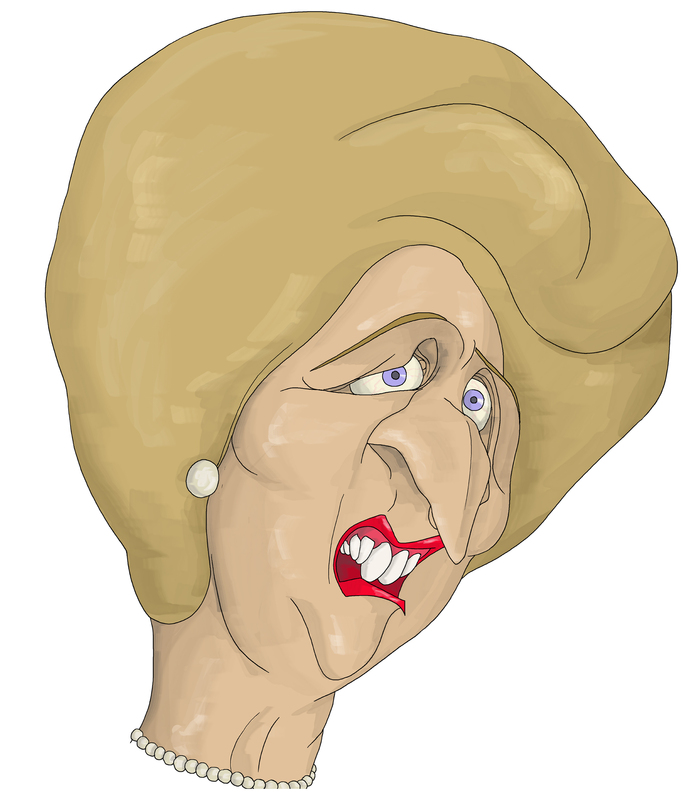 She was a dream to draw so any excuse to do her in black and white or in colour as here is wonderful and today, the current leader of the Labour Party (and a man I remember meeting on occasion as he flitted out of Corpus where a great friend of mine – a committed Thatcherite- was ploughing away at a doctorate), has come out with a plan that categorically demands to be slapped down by the Lady in blue. She would have said of this plan as she famously said of Socialism in general, “the problem …is that you eventually run out of other people’s money”. Now, Miliband proposes to cut the University tuition fee from £9000 by £3000 or so, and to do this, he plans to tax savers. In other words, all those people who have dutifully followed present Government advice and put money away for a rainy day will have it pinched and given out willy nilly to students who think the world owes them a living. 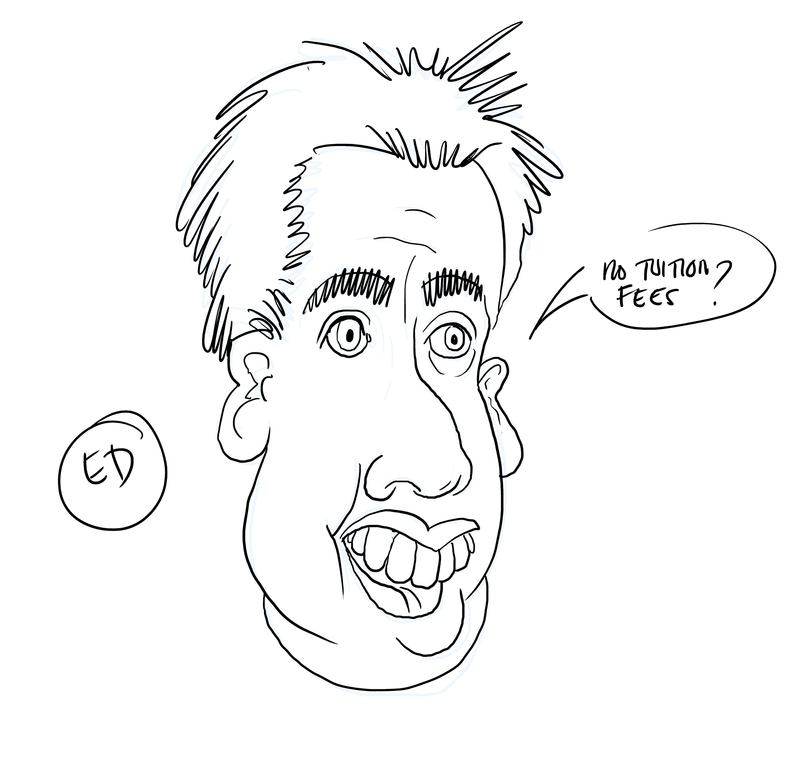 I wonder how many times Ed plans to raid the piggy-bank? Specifically, the costs would be met, he said, by reducing tax-relief on pensions for anyone earning over £150,000 per year. I am sure that was greeted, even in Labour circles, by barely disguised squeals of pain! It’s like handing the teenager the family car to crash. Miliband is quite right that the current trail of debt that lies in the wake of our further education experiment is wrong, leaving many students with over £44000 to pay off after graduation, but it is not as simple as that. The whole system creaks because it is allowing enormous debt to build up all over the place, and some of it that must inevitably be written off. (I would make the case case, incidentally, against conscription, surely a waste of so much money in so many countries across Europe. If you want an army, you have to set one up with a serious plan, proper training on proper equipment; it is not a serious fighting force if it is simply seen as a rite of passage) At the same time, the caps on tuition fees mean that Universities cannot really charge what they feel they are worth and everyone in this deal is struggling to make ends meet. Often when there is a mess like this and on this scale, we can look around and see at least someone leaping around with a smirk of satisfied delight, but in this case there seems to be no one. Everyone suffers! It becomes even worse when you reflect that it was the Blair government that put pressure on smaller universities to expand their campuses and trade in their carefully hoarded private wealth for reliance on state funding. (Why would they do this?) You only need to look at the mess of the Stockton campus in Durham to see just how badly this sort of thing can go, and Durham was certainly not alone. We were wrong to try to send 50% of all school leavers to university. That is the bottom line. University should be an exceptional experience and not a routine rite of passage. It is not about drinking ale and recreating scenes from the “Inbetweeners’ movies”. University life is about learning how to process information at speed and under pressure. It might also be about gathering specific skills, but it is a privileged time and we should teach students they need to value that experience. In fact, by demanding that so many students pass through the University gates, we have cheapened the further education brand, jacked up the overall cost and encouraged the development of a range of “mickey mouse courses” that beggar belief. Miliband’s proposal is more extreme- he is taking from Peter to pay Paul. But essentially, while they maintain this fantasy that 50% of all students deserve a University place, any plans are merely an attempt to rearrange the bunting at “Freshers’ Fayre”. UKIP does better than the other parties, demanding a reduction in that 50% aim and offering to cut the tuition fees on key subjects. I think these would be things like Physics, Medicine, Computing and engineering. While I might quibble with the subjects on offer “at discount rates”, I think the overall vision is remarkably clear. It is not yet clear how this would be funded- in my own opinion, and in the long run, if our universities were to recover their reputation for overall excellence, the number of foreign students might well provide an opportunity to raise enough money to fund scholarships to cover the tuition costs of education National students in important subjects. But this might take time and Heavens! We need to start treating foreign students better than we do now. Not only do they pay more but if we get it right, and they profit from their education here, they will be the leaders of their own countries in a few years and it will be to them that we turn for alliances and assistance. If we treat them badly, why would we expect them to want to do business with us? This was one of the great principles of the British Raj and one of the great disasters when Edward Heath turned his back on the Commonwealth. We need those committed international alliances that are forged over decades, not weeks and that are of mutual benefit. We need to know there are people across the world who speak our language, both culturally and linguistically. In short, abandoning the Tier 1 visa, like so much of the visa bullying that surrounds the education of foreign students in the UK is stabbing ourselves in the collective foot, and we will suffer greatly in years to come for our short-sightedness and parsimony. More on this later in a dedicated post! Putting our house in order, not promising to spend more than we can afford, while rewarding those who put in the time to study those skills we badly need- all this is simple, as Mr Farage would say simply a matter of “Common Sense”.